After all the long wait and anxiety, Linkedin is finally on mobile. Wonder what it had taken them so long. Just enter m.linkedin.com on your mobile browser or your iPhone and it will take you directly to the optimized mobile version of linkedin. I had tried both on my N95 and iPhone and i must credit their developers for a well done job as the initial user experience on both my phones had been good. Infact its better on the iPhone with some resemblance UI of facebook. I m sure their developers must had taken some ideas from iPhone's facebook UI. The mobile version will surely help to further accelerate the growth of linkedin. The regular website has been on a roll for the past one year, nearly tripling in unique visitors in the US to 3.6 million in January 2008, according to comScore. 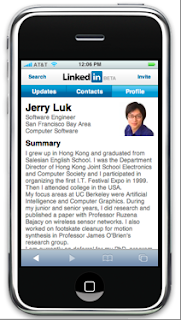 A LinkedIn enginner, Jerry Luk gives a demo of the new mobile service with this YouTube video.